What exactly is a mandolin? On the simplest level, the mandolin is a small, lute-like instrument with eight strings. Originally appearing in 18th-century Italy, this bright-toned instrument has become a staple in styles of music all over the world, ranging from classical to bluegrass and even to jazz. But that’s only a small part of the story of the mandolin. The instrument we now call the mandolin first truly appeared in the workshops of Naples, Italy, in the middle of the 1700s. But similar instruments going by the names mandora, mandola, and mandore preceded the Neapolitan mandolin by centuries. The mandora first appeared as early as the 15th century in Italy. 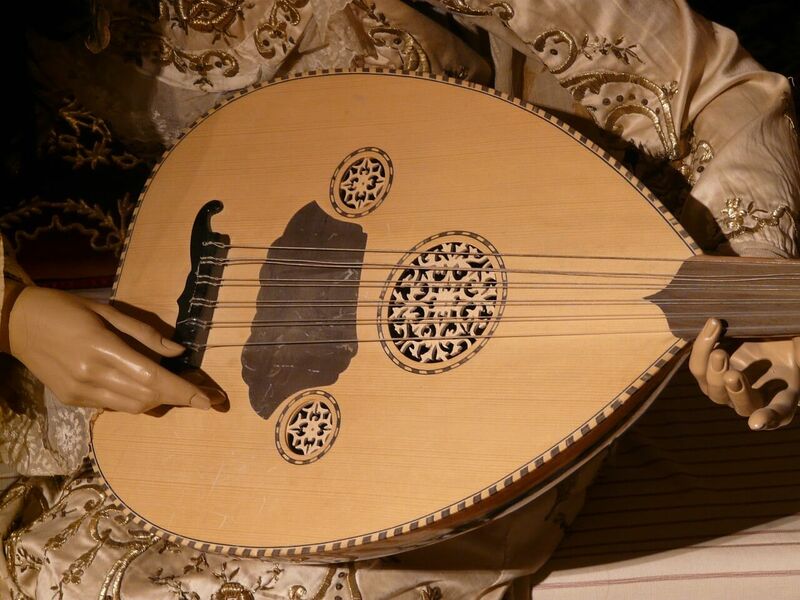 Starting out with only four or five strings, its name probably came from the word mandorla, or almond. With gut strings, a pear shaped body carved from a single piece of wood, and no frets, this instrument had a deeper, sweeter tone than today’s mandolins. The term mandora has since come to refer more broadly to mid-sized mandolins. By the Baroque period (roughly 1600–1750), a new instrument had developed that was known as the mandolino, or little mandola. It was primarily a melodic instrument, which differentiated it from the lute, which played both harmonic and melodic roles in the music of that time. The modern mandolin, at least in the European-style roundback design still favored outside of the United States, developed from the mandolino between 1750 and 1850. The Vinaccia family in Naples played a crucial role in this development throughout that period, and Pasquale Vinaccia (1806–82) is the man who was most responsible for establishing the standard design of the instrument. 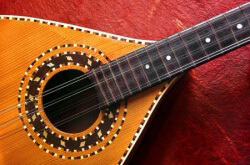 Among the developments that differentiate the mandolin from the Baroque mandolin were a bent soundboard, a raised fret board, more frets (and therefore more notes), and 8 metal strings. The strings are paired in sets, known as courses, of two, in which each pair of strings is tuned to the exact same pitch. This means there are actually only four pitches represented by the eight strings. The strings are tuned to the same pitches as are the strings of a violin – G, D, A, and E, from low to high. The mandolin’s metal strings made a new style of playing possible that was marked by the tremolo technique, in which the player rapidly moves the pick up and down on a single pair of strings, creating a rapid-fire repetition of a single pitch. In that time, picks (or plectrums, as they called them) were typically made from tortoise shell. In the second half of the 1800s, the mandolin began to become a worldwide phenomenon. Virtuoso performers such as Carlos Munier, grandon of Pasquale Vinaccia, toured Europe and persuaded audiences that the mandolin was more than just an Italian folk instrument. And, from the 1870s onward, masses of immigrants to the United States from Italy brought their mandolins along with them. A curious group of musicians known as the Estudiantes españolas from Spain traveled around the United States in the 1880s, creating a swirl of attention in the still young nation. The instruments they played were similar to mandolins, called bandurrias, but the mandolin was the instrument in its family that stood the test of time. One early maker of mandolins in the United States was the still-extant Martin Company, but even more crucial was the Gibson Company, based out of Kalamazoo, Michigan. Gibson had a designer named Lloyd Loar, who created two new designs for the mandolin, each with a flat back rather than the typical (to that point) round or bowl back. One of Loar’s designs is known the A-style mandolin; the other is the F-style, which has F-holes like a violin. These new designs had a more guitar-like sound, making them better suited to strumming than their Neapolitan bowl-backed counterparts. Some argued that the new designs sacrificed the sweeter tone of Italian mandolins. But in return, they achieved greater projection and a sharper attack, two qualities that became essential to the mandolin’s role in bluegrass music. The mandolin’s spread in the United States was furthered by the establishment of mandolin orchestras, which encouraged large groups of people to take up the instrument together. Flat-backed mandolins became the norm in the United States, but elsewhere bowl-backed mandolins remain much more popular to this day. 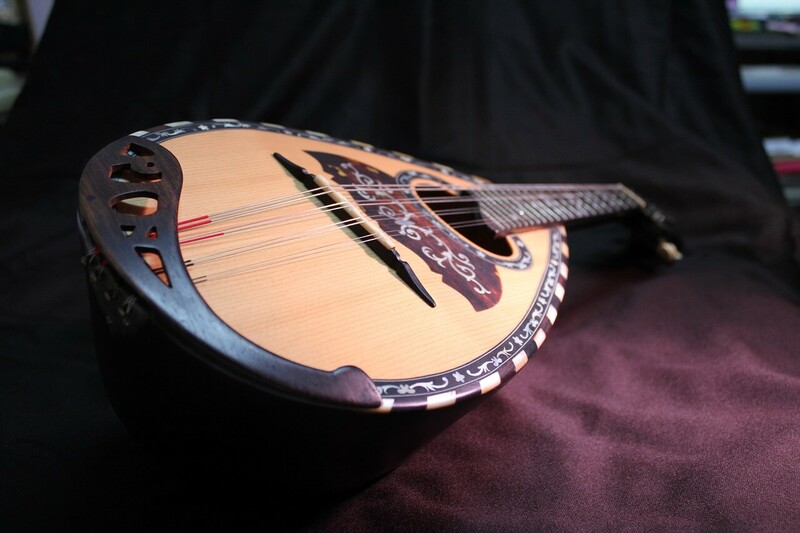 The earliest music for the mandolin is found in Italian classical music and folk music. In the classical world, composers like Antonio Vivaldi (1678–1741) incorporated the mandolin into the orchestra. Vivaldi himself wrote two concertos for the instrument; one for mandolin solo and one for two mandolins. Another composer, Wolfgang Amadeus Mozart (1756–1791), wrote music for the mandolin in his opera Don Giovanni. The style of Mozart’s music, however, is actually based on folk music rather than classical music – it is in fact a folk song played by a character within the classical opera. In the Italian folk music that inspired Mozart, the mandolin was often used to accompany romantic songs and dances. This style of music is still commonly heard in the Italian countryside, in movies like The Godfather, and in Italian restaurants the world over. Its sub-genres range from fast-paced tarantellas to romantic serenades. In the United States, of course, the mandolin is best known for its role in bluegrass music. Along with the fiddle, guitar, banjo, and bass, it forms the core of the bluegrass sound. 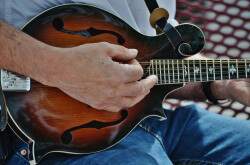 In a bluegrass band, the mandolin often plays full chords, boisterous solos, and other techniques far beyond traditional mandolin style. Outside of these primary genres, the mandolin has found its place within a nearly limitless array of musical styles. American country, jazz, pop, Brazilian music, Latin music, and folk music from dozens of countries have all played host to talented mandolinists. In part because it has the same tuning as a violin, the mandolin is particularly adaptable and has proven a resilient instrument through the twentieth century and beyond. The central part of the mandolin’s anatomy is its body, the hollow chamber that serves as an echo chamber for the sound produced by the strings. 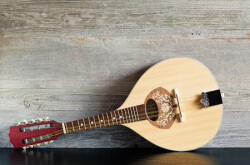 The piece of wood on the top of the mandolin’s body is known as the soundboard. One or two sound holes are carved into the body; they allow the sound to project from the inner chamber out into the world. F-style mandolins (and some A-style mandolins) have two f-shaped holes, which are inspired by the holes on a violin’s body, as opposed to the single, central hole of the guitar or bowl-backed mandolin. At the bottom of the body, a tailpiece serves as the base to which the strings are attached. The strings travel from the tailpiece over the bridge. On a mandolin, unlike on a guitar, the bridge is movable and not attached to the body. This allows for small adjustments in tuning. The bridge is held in place by the tension of the strings. On top of a mandolin’s body you may also find a pick guard, which prevents the wood from being scratched by a pick. The mandolin’s eight strings, paired in sets (known as courses) of two, go over the bridge and across the mandolin’s neck, which extends out from the main body of the instrument. The mandolin has a relatively short neck comprised of two main parts: a fingerboard and frets. The fingerboard is a flat piece of wood attached to the neck, while the frets are thin pieces of metal that are hammered into channels on the fretboard. The frets stop the vibration of the strings at a specific point along the neck of the instrument, creating a different pitch depending on the length of the string. The strings end at the final major part of the mandolin, its head. 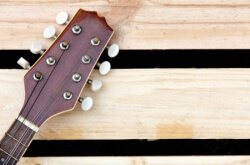 The head is a solid piece of wood that hosts the tuners, a set of eight pegs attached to gears that are turned to tighten or loosen the strings, which in turn raises or lowers the pitch of that string. Be the first to check out our new articles!